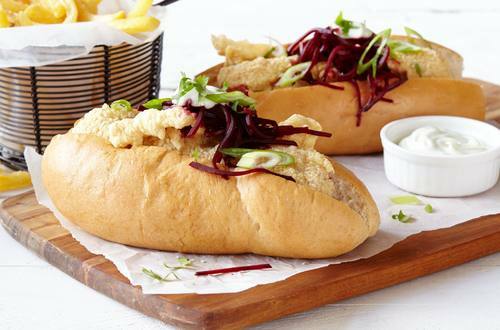 Try this mouth-watering tempura hot dog recipe that just hits the spot. Crisp, golden and creamy Hellmann's® or Best Foods® Real Mayonnaise. A flavorful crunch in every bite. 1 Combine vinegar with sugar in medium bowl until sugar is dissolved; stir in beets. Cover and marinate at least 30 minutes. 2 Heat oil in medium skillet over medium-high heat. 3 Beat eggs with iced water in medium bowl with wire whisk or fork, then beat in 1 cup flour; set aside. Dip hot dogs in remaining 1/4 cup flour, tapping off any excess, then dip in egg mixture. Cook hot dogs in hot oil until crisp and golden. Drain on paper-towel-lined plate. 4 Arrange cooked hot dogs in buns, then top with beet mixture, Hellmann's® or Best Foods® Real Mayonnaise, cilantro and green onions.